Humanity is messy, lonely, complex, sad, magical, mystical and beautiful. In order to touch your readers in personal way, pour your real feelings and original thoughts and ideas into your writing. Share your personal reality, and the truth as you perceive it, without trying to go along with the what others tell you that you are supposed to believe. Writing is where you can be real. 1. Learn something new by googling a topic you are interested in or statr with Wikipedia. 2. See where this leads you. I sometimes read a Wikipedia post on one topic and become introduced to a new phrase, inventor, author, or concept during the post. 4.Watch a youtube video about the most interesting idea you have found…or start with YouTube for researching topics to begin with. 5. See if anyone else has posted about this topic and form your own opinions, choose a side, expand by adding a new perspective or write a poem or short story about it. 6. Let the things you learn about inspire new ideas. Draw from your personal experience and your imagination. 7. You can use things you learn to write a researched post, an editorial style post, a self help post or a fictional story. 8. Try a new writing genre once in a while. You may be pleasantly surprised that you can write outside of your usual nitch. 9. We tend to go with what is familiar. But it can become uninspiring. Let your brain be creative because the challenge will get tbe dopamine flowing. 10. Think outside the box. Just because no one has ever thought of something in quite the same way does not mean you cannot write it. 11. Think of the reader. What is the goal of the reader? Why do they read your blog? What else would they like you to give them? 12. Be authentic and write from tbe heart. You may think that no one is interested in your feelings, perspectives ad ideas but then again…you might be pleasantly surprised. 13. Blog about a question you have or something you are searching for answers about. Pose the qiestion to the readers. Tell them what this question means to you and why it is important to you. 14. Get ideas from the comments other bloggers leave you. Reading and replying to comments is a great way to find out what your readers are interested in and more importantly …why they are interested and what things mean to them. 15. Try a new medium or craft like photography, drawing, zen tangles. Post a picture of what you did and tell the readers you are learning this and why. Tell them why it is important to you to learn something new, why you chose this particular thing, etc. 16. Blogging is all about the individual perspective and what things mean to you. Even fiction writing has to do with the uniqie view of the person and the meaning of ideas to them. 17. Write something short. I have seen bloggers write one or two sentences that were thought provoking. Leave it up to tbe reader to add their personal meaning and fill in their own mental pictures. 18. Sometimes less is more. Do not feel obligated to write 600 words. People read books when they have more time and blog posts when tbey are short for time…or short on attention ability due to the stress of life. 19. Give people something to ponder. Give people something to work with in tbeir brains to get tbose creative juices flowing. You do not have to always ecplain things to death. 20. Try creating a meme with image chef. You only have to write one or two inspirational or thought provoking lines. Are you looking for new ways to spice up your writing and get your readers to really respond to what you say? Do you ever have to give talks, presentations or speeches? Maybe you make YouTube videos. Here are some ideas for making your talks more memorable and perhaps your writing too. These tips are designed for people who give presentations or talks, however there is something that can be gained from this advice as far as writing goes as well. After all a speech is a piece of writing that is given verbally. This video is from the Stanford Graduate School of Business. It discusses ways to get the attention of your audience with a great opening. It also gives some ways in which you can close the talk as exciting and interesting as you opened it. I recommend watching the video if you are interested in this topic. The speakers do a good job of communicating this information by using demonstrations of both good and bad openings and closings. But I will give you the main ideas here. The three ways they suggest to open a talk are as follows. They also give specific examples of Ted Talks that used each of these. One of the Ted Talks happened by one of my favorite speakers, Kelly McGonigal. This video suggests three ways to close a talk so as not to lose steam from the momentum you created during the talk and so as not to lose the audience at the end. The ending is very important because often it what sticks with the listeners (or your readers) after they leave. The ending is so important because this is where you have the opportunity to cause your audience to take action of some kind. This might be a new way of thinking or feeling. It may also be a physical action or to change something about themselves. Here is the video for your enjoyment. Let me know what you thought about it in the comments and if you see any ways that you might be able to incorporate any of these ideas in your writing. Did you notice anything I may have used in this post? If you enjoyed this video, here is another video from the same YouTube channel. This one is particularly relevant for public speaking. It talks about voice, body language, eye direction and other presenting issues. State management is also important, which is to present a certain mental, emotional state that will transmit to your audience. Writers can bring out the humanity in their readers. Humanity is messy, lonely, complex, sad, magical, mystical and beautiful. In order to really touch your readers, pour your inner longing into your writing. Readers can tell when you are putting real emotion into your writing. It sends an energy connection from your soul to theirs. Great writers put their real feelings into their stories and poems. They infuse their own humanity, into their characters. The doubts and questions that haunt their own soul, are spilled into their work. For fiction writing, the events in the story do not have to have really happened. But if you dig deep into your inner self, you will be able to breath life and humanity into your characters. In great stories the characters are as real as people you know in real life. You feel like you know them, and you have real emotions about them. Humanity is the lifeblood of poetry, creative writing, and blog writing. If people can relate to the humanity in your writing, they will keep coming back for more. People do not read a new blog because they want to learn about you, as much as they are searching to learn more about themselves. They may come back to read your blog, because they care about you and how you are doing. But initially they were searching for something that spoke to them personally. Readers are seeking to find a connection with their own experiences and feelings. They want to understand themselves better. Your readers are looking for something about themselves in your writing. This is not to say that you are writing about them directly, but you are putting elements of your own humanity into your writing, that they can relate to. Great writers will guide their readers into finding the truth within themselves. In order to do this, you must look inside your own mind with courage. You must take a journey into your own soul and see what is inside. Bloggers tend to write about things that are part of their daily lives. You can write about yourself and be honest about your own insecurities and inadequacies. Transparency and honesty make readers feel safe. They feel safe that they are in the presence of a real human, who can understand and relate to them. You are relatable to your readers because you are not perfect. They will feel that stopping by your blog is like being in the arms of understanding and validation of their own humanity. Creative writing is about characters and how they interact with their surroundings and the situations they are put into. If you infuse your characters with real humanity, then they will take on a life of their own. You can create characters and situations that are not from your real life. But put yourself into them. The elements of longing, suffering, desire, and searching for meaning in life, will give your characters a virtual reality that will capture the hearts of your readers. 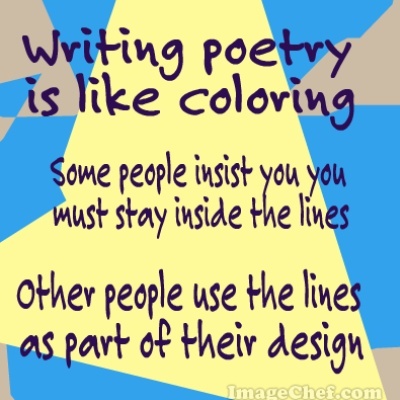 Poetry is a special kind of writing that paints emotions upon the page. It is free and you are not bound by any rules. It is a beautiful, thought provoking painting with words. You can begin your “word painting” by splashing a color upon the page that represents the first emotion you feel, when you first sit down to write. Then dip into your color pallet as you paint the reality of the human condition upon the page. I am a musician and an artist. I have trained in music for half of my life and have found it to be very expressive. I am also an artist and have spent endless hours exploring ways to express human emotion with art. I find that writing has elements of both music and art. Writing is a way for humans to connect with each other, in a truly meaningful way. Great writers can connect different generations and different cultures together. Writers can magically unite past, present and future, by writing in a way that is timeless. What does timeless mean? People refer to things as timeless when they are easily understood by people of any generation. Love is a universal truth that is timeless. Other timeless human conditions are death, desire, longing, joy and sadness. Trust, deception, betrayal, collaboration and sensuality are all timeless realities as well. When we see old movies, we can relate to these themes in the stories. If we could not, then the classic movies would not be “classic” at all. Universal truths will speak to people from all different walks of life. The human experience is one that people need to connect with each other about. It is entirely too painful to endure alone. When you are writing something, picture yourself as the reader. What elements of your own humanity would speak to you, if you were the reader? What would you need from the writer? The reader / writer relationship is a special one. It has elements of a romantic affair. The reader has inner desires and needs. The writer does their best to put themselves into the writing, in order to satisfy the desires of the reader.